In 1884, former minister, lumberman, horseman, buggy maker, renowned author and perpetual promoter of the wilderness, W.H.H. (“Adirondack”) Murray established the Snow Shoe Café, a small oyster-bar and café in Montreal, Quebec. The establishment was located on Notre Dame Street, where Murray sold oysters, New England doughnuts, brown bread pies and baked beans. There, the stranger found clean table, good food and home-like quietness. 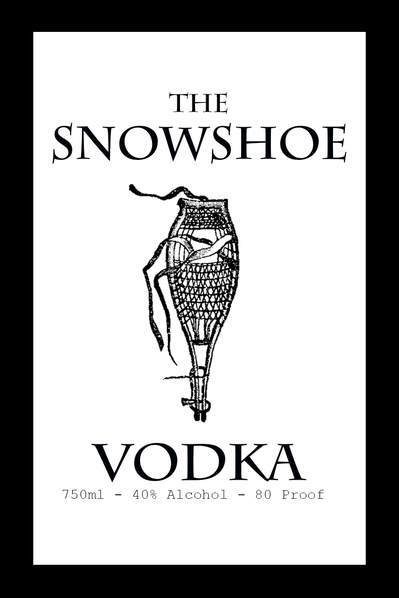 Flavor Profile: The Snowshoe Vodka is created with NY corn and small amounts of barley. This two-grain vodka results in a unique profile that has been described as "earthy", "wheaty" and "very smooth". W.H.H. Murray introduced the Adirondack Wilderness and the joys of camping to the people of the United States. Awe-inspiring peaks such as Upper and Lower WolfJaw inspired Murray's creativity and zest for a life amid nature's beauty. One hundred and fifty years later, the Adirondack Mountains have the same impact on our spirits. WolfJaw whiskey is a single malt whiskey that captures the thrill and aw of the Adirondacks with its smooth beginning and campfire-like finish. Flavor Profile: WolfJaw is produced with NY malted barley and small amounts of peated barley. It is aged in new American Oak barrels. This whiskey has enticing butterscotch aromas with emerging hints of campfire. Tastes reminiscent of brown sugar and vanillas provide the backdrop for bursts of pepper. Smoke from the peat comes to the forefront at the slightly hot finish. Flavor profile: Created with 100% NY apples and aged in new American Oak barrels, the award winning La Pomme du Lac Apple Brandy ​boasts the comforting autumn flavor of apples combined with an adventurous spice.